Maybe it is just me but the Seville seems to be missing from the 5th wheel lineup on the front page. My understanding was that the Seville and Kingston were replaced by the Rushmore. Check out the product positioning page, it will not link up to the Seville. Good move, the Seville was quite nice but it had a hard time up against the Big Horn, Designer, and other mid-level full profile campers. The new Rushmore is much better suited to compete against the compeition. Aside from the change in colors and a change in the master bedroom closet design, the floorplan appears to be exactly the same as my 09 Seville 35ck, so what's up with the change in name? 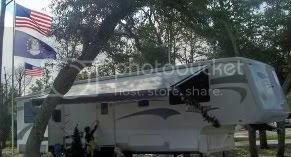 No different than our 2010 Seville, other than the closet change andI preferours.These RV companies change names of their model lines to keep up with the Jone's. Not even car companies change their models as fast as the RV manufacturers. That is how we felt when CR discontinued the Silverado line.